Thorn Apple: Plant towards a healthy and blissful life! In Ayurveda texts; Dhatura or Thorn Apple is recognized as an important herb in almost all alchemy books. It is a yearly herb which grows 2-5 ft tall. The stem is smooth and the leaves are oval, long, pointed and at the tip it is like a spear. 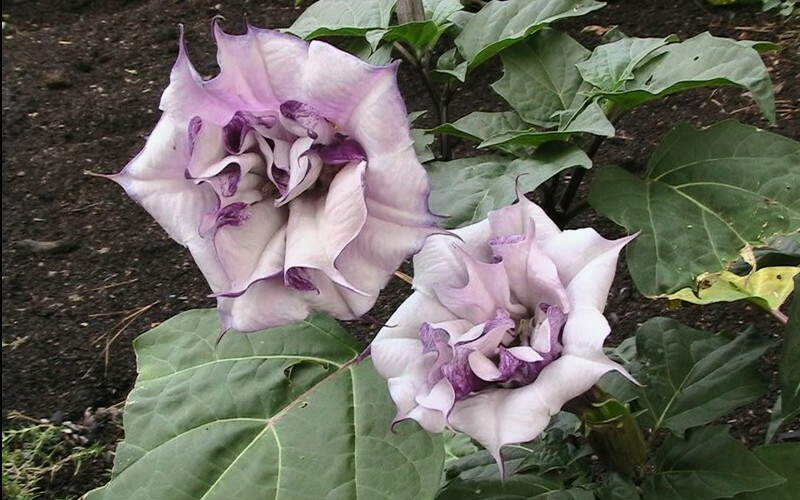 It bears flowers which are 5-6 inches long and grow in bunches; mostly they are purple from outside and white from inside. The fruits are big, round as a big lemon. It is thorny and hanging down. The seeds are flat, yellow or light greyish in colour. The leaves have a bitter and nauseating taste. Thorn apple is also called Jimson weed, Devil’s snare, moon flower, devil’s cucumber, pricklyburr, stink weed and many more. It belongs to kingdom Plantae and ‘Solanaceae’ family. 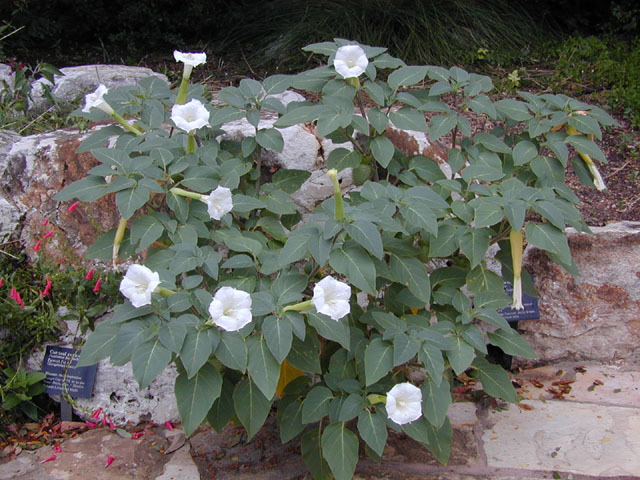 Its binomial name is “Datura stramonium”. In Hindi it is also called Dhatura or Kala Dhatura whereas in Sanskrit terms it is called Dhattur, Shivpriya, Matul etc. 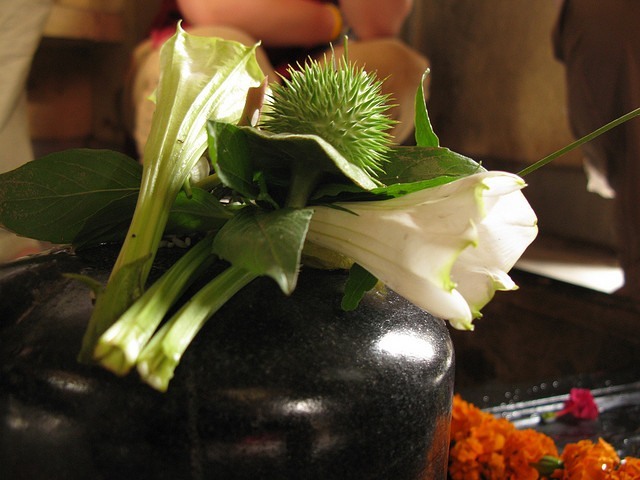 Thorn Apple or Dhatura is discussed in Suhurut Samhita, as it is a favourite of Lord Shiva. Its flowers and fruits are offered to Lord Shiva. It is recognized as a religious herb and is majorly used in worshipping. Thorn Apple or Dhatura contains many elements and chemical compounds in it. The leaves and seeds contains two alkaloids; hyoscyamine and hyosin varying as 0.25 to 0.55%. In addition, it also contains a few resins and stable oils. Now, lets move to our main topic. It is the healing/medicinal benefits of Thorn Apple or Dhatura. 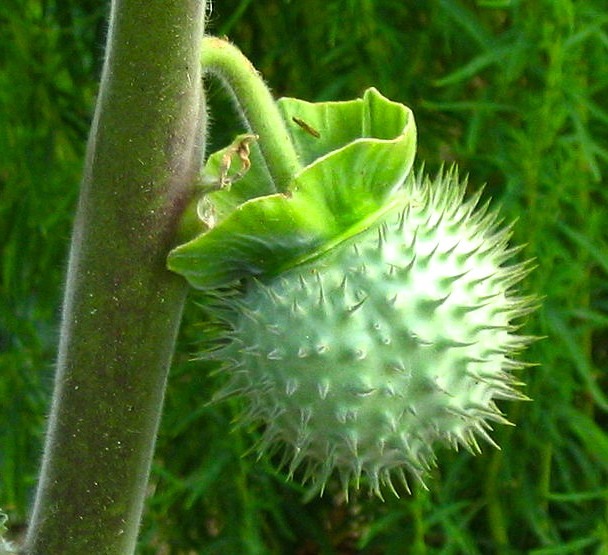 Actually, the fact is only few of us knows the medicinal benefits of Thorn Apple. One must know that this very herb is enriched with benefits. Some of them are listed below. Headache is a common problem which is seen is 8 out of 10 persons. There can be many reasons for headache but thorn apple is a common medicine for all kinds of headache. Swallow 2-3 seeds of thorn apple on daily basis. It cures even old problems of headache. Take the seeds of black pepper and thorn apple. Grind them in the juice of pitta papada; give this to the patient once a day. Take equal quantities of seeds of Thorn Apple and black pepper. Prepare tablets of 100 mg each. Give 1-2 tablets twice a day with butter. It is beneficial in case of head injury problem or due to drinking Ganja, travelling in sun etc. Within few days it will be curing the symptoms as well as the disorder. Heat the juice of its leaves till it thickens. Apply the paste on the back of ear. It cures swelling. In case of Ottorhagia, take 8 parts of mustard oil, 1 part of gandhak and 32 parts of Thorn Apple leaves juice. Mix all them and prepare a medicated oil. Put 1 drop of this oil in each ear twice a day. Extract the juice of whole plant and cook in sesame oil till only oil is left. Use this oil for massaging and tie the leaves on the joints. Apply the paste of leaves in affected area. It is beneficial in curing pain. Grind its fruits, branches and leaves. Dry it and prepare a powder. Smoke this powder; it cures bronchial asthma. Take equal quantities of Thorn Apple, black tea, shora and tobacco. Grind them to form powder. Prepare cigarette with this powder and give to the patient to smoke. It is helpful in controlling Asthmatic attack. Grind the Dhatura leaves and mix shilajit in it. Apply this paste to cure swelling of stomach, lungs, joints, bones etc. Give 125 mg of ash of its seeds to the malaria patient twice a day. Give 65 mg of seed powder before the onset of fever. It helps to cure fever completely. Take equal numbers of Dhatura leaves, nagar bael leaves and black pepper. Grind them and form small tablets. Give 1 tablet twice a day. Take 4 parts of mustard oil, 16 parts of its leaves juice and 4 parts of leaves pulp. Cook them in a low flame till only water is left behind. Store this solution in a bottle. Apply this on hair and scalp. It helps to kill lice. In case of any kind of eye problem, apply the juice of its leaves on the paining eyes. It cures the pain. In case of infected wounds, rinse the wound with lukewarm cloth and tie the cake of Dhatura leaves on it. It helps to cure wounds naturally. 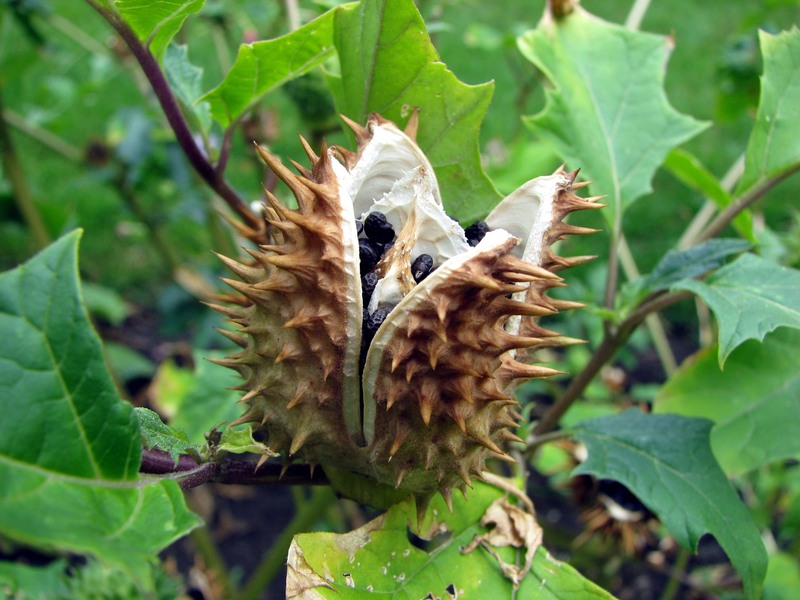 How to prepare Thorn Apple oil? Take 400 ml Thorn Apple juice, 25 gm turmeric powder and 100 gm sesame oil. Mix all them and cook in low flame till only oil is left. Strain the oil and store it. This is useful in curing the ulcer in ear vessel. Give cold infusion of the flowers and leaves of cotton. It cures the poison of Thorn Apple. Thorn Apple in excess quantities serves as a poison. Due to its dryness, it causes numbness in the body. It may also cause headache, madness, drowsiness and may kill the patient. It is safe for external use only. Hence, it must be used carefully. So, in this way we saw numerous benefits of Thorn Apple or Dhatura. All the herbs are rich in benefits; so go green and live well!